The tiny St. Jude's Chapel of Hope is very big in beauty. Located in the community of Trust in Madison County near Hot Springs (along the Appalachian Medley Scenic Byway), the roadside chapel is always open to the public for a peek inside. It was built in 1991 by the Baruito family after Beverly's miraculous recovery from cancer. There are no regular services there, but many visitors stop by for a moment of meditation. There's only seating for eight! Unfortunately, Beverly died in 2002, but the chapel remains open. 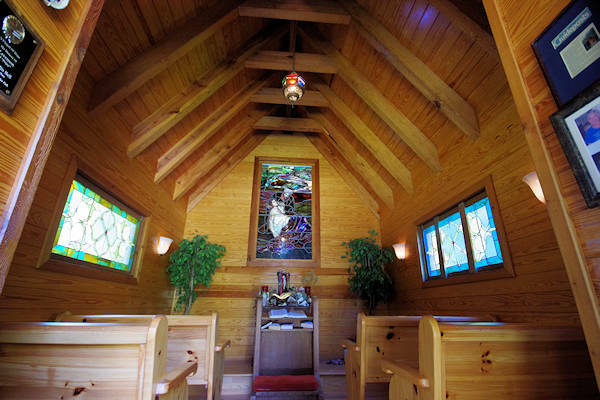 Made of cedar, the chapel has beautiful stained-glass windows, four pews, prayer bench and a shrine to St. Jude (with photos and items left by visitors). 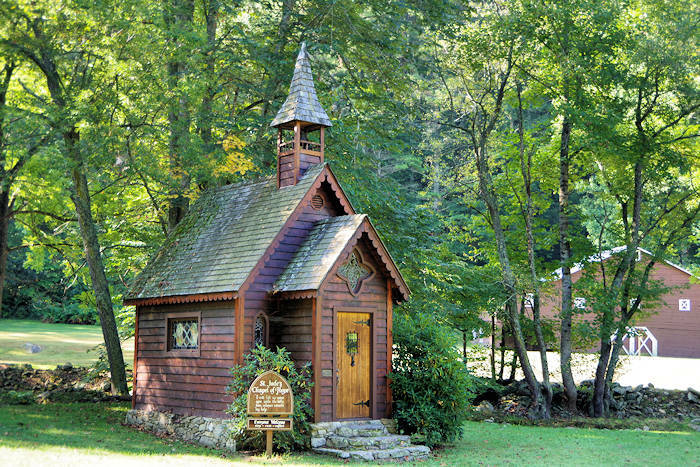 Built in 1991, the tiny church measures only 12 x 14 feet. In the community of Trust at the junction of NC highways 209 and 63, you will be delighted with the sight of a small chapel. And, your delight will increase knowing that it’s always open to the public. St. Jude’s Chapel of Hope was built in 1991 by Beverly Barutio and her husband to thank the saint whom she credits with her miraculous recovery from cancer. Made of cedar, the chapel features stained-glass windows; four small, polished pews; a prayer bench and shrine to St. Jude; and even a bell in the belfry, the chapel measures a diminutive 12 x 14. It serves as a place for quiet meditation both inside the chapel or on the grounds. The chapel is located on NC Highway 209, about 2/10 of a mile before it ends at NC 209. 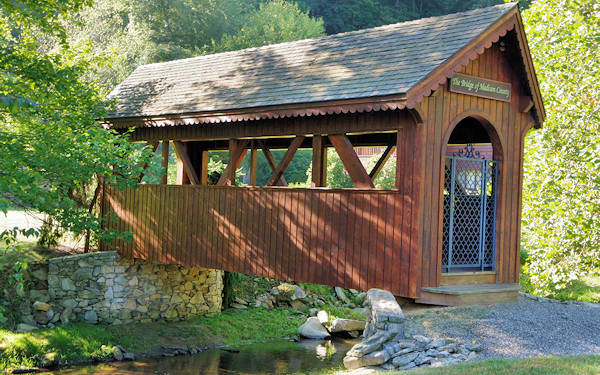 The beautiful setting also includes a covered bridge "The Bridges of Madison County" facing NC Highway 209. 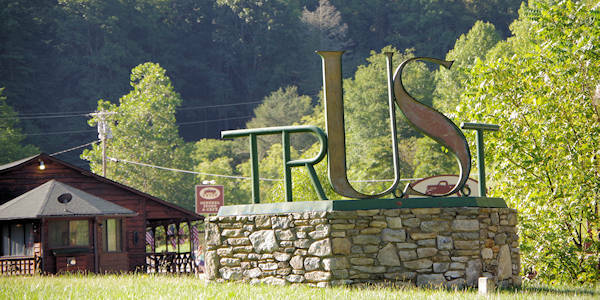 St. Jude's Chapel of Hope is adjacent to the Trust General Store (GPS address 14535 NC-209, Hot Springs, NC). 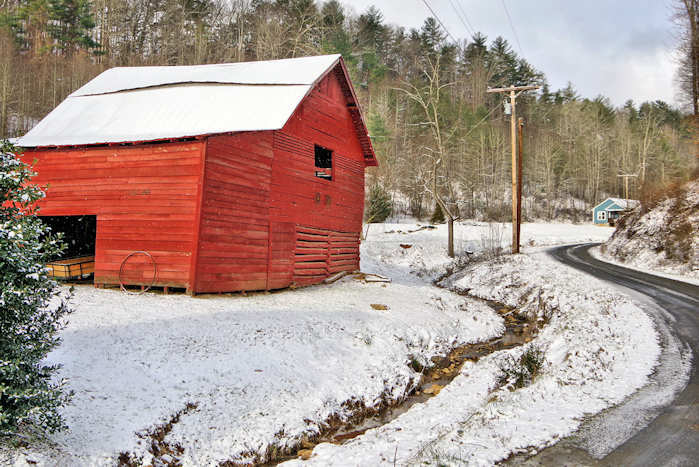 Read more about other places to see along the Appalachian Medley Scenic Byway. The town and spa of Hot Springs is 15 miles north. 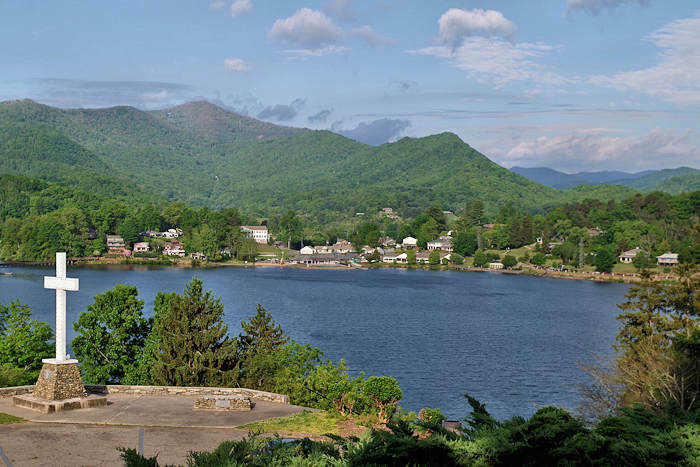 About 22 miles south is Lake Junaluska with more inspiring spots for all to enjoy - including lakeside hotels and walking trails. The epic hike at Max Patch is about 12 miles away.